1. Lightly grease a 1-litre pie dish. Trim crusts of bread and arrange half of the bread in the pie dish. 2. Whisk ingredients A until well mixed, and spoon half the mixture over the bread. 3. Top with sliced apples and raisins, then cover the apples with the remaining bread slices. Pour the remaining milk mixture on top. 4. In small bowl, stir together the sugar, cinnamon and nutmeg, then sprinkle this sugar mixture over the bread. 5. Dot the bread pudding with butter and let stand for 30 mins. 6. Place the pie dish in a large deep baking dish. Carefully pour boiling water down the side of the dish until it comes halfway up the sides of the tin. 7. Bake in a preheated oven at 180°C for 50-60 mins or until a knife comes out clean. 8. 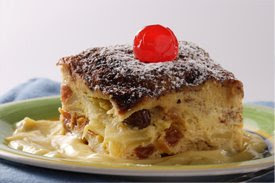 Cut warm bread pudding and serve. A Prayer for the Stressed! Do you ever think laterally?